The diplomatic venture looks at three central issues: Vietnam’s intensifying rivalry with China over the South China Sea, its gloomy economic conditions, and the communist regime’s human rights record. First, the newly inked comprehensive partnership with the United States can be seen as another step in reinforcing Vietnam’s hedging strategy against China and provides it with more confidence — and indeed more options — in confronting China in the South China Sea. In their joint statement, the two leaders ‘reaffirmed their support for the settlement of disputes by peaceful means in accordance with international law’ and ‘the principle of non-use of force or threat-of-force in resolving territorial and maritime disputes’. They also stressed the importance of the full observance of the Declaration of Conduct of Parties in the South China Sea as well as the efforts to conclude a Code of Conduct. Vietnam is likely to enjoy greater support from the United States through diplomatic channels to resist increasing Chinese pressures in the South China Sea. From the US perspective, the comprehensive partnership — and the diplomatic support it offers Vietnam — will help strengthen its relations with the communist country at a time when its strategic rebalancing toward Asia requires the strong and persistent support of key regional players. Second, the two presidents also reaffirmed their commitment to concluding the Trans-Pacific Partnership (TPP) agreement as soon as possible this year. While Vietnam’s participation in the TPP negotiations may have been driven in part by its strategic calculations, especially vis-à-vis China, the economic benefits to be gained in concluding the TPP provide the strongest incentive to pursue the multilateral trade arrangement. As the Vietnamese economy continues to record weaker growth, which has contributed to the public’s rising resentment against the Communist Party’s rule, Vietnamese leaders expect that the TPP’s conclusion will not only stimulate the economy but also improve their political standing at home. It should be noted that economies of the TPP,now including Japan as a new member, absorbed up to 39 per cent (US$45 billion) of Vietnam’s total exports in 2012. As the United States remains the largest export destination for Vietnamese products, greater access to the US market through the TPP is particularly important for Vietnam’s economic recovery. Deeper economic engagement with Vietnam through TPP mechanisms is also consistent with America’s economic interests, as it is seeking greater access to foreign markets to support its economy. Vietnam, despite its current ailing economic conditions, will continue to be a promising market and economic partner for the United States. At the same time, encouraging Hanoi’s deeper economic integration will also fit into Washington’s broader strategic calculations, including strengthening the US–Vietnam relationship against the backdrop of a rising China and pushing the communist country closer toward economic liberalisation as well as potential democratisation in the long run. Lastly, the communist regime’s human rights record remains a sticky point in the newly announced partnership. 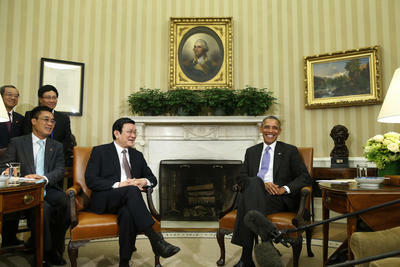 Both Vietnam and the United States face their own dilemmas over the issue. Leaders of the Vietnamese Communist Party may see promoting human rights as posing a threat to their regime’s security. And for the United States, it is a moral dilemma between upholding human rights as a key principle in its foreign policy and downplaying the issue in its dealings with Vietnam for strategic benefits. There’s no doubt that this issue will continue to present a considerable challenge to the development of US–Vietnam bilateral ties in the future. Although some may argue that a strategic partnership rather than a comprehensive one is what the two countries should ultimately strive for, the announcement of the latter has already been the greatest step forward in bilateral diplomatic relations since normalisation in 1995. How the two sides categorise their relationship is indeed not as important as what they do in practice to promote common interests. In this regard, how the bilateral relationship will further grow will depend on the Communist Party’s perception of the opportunities and risks that a closer relationship with the United States presents for the regime’s political security and Vietnam’s relations with China. Meanwhile, how Washington evaluates the significance of the human rights issue versus other tangible economic and strategic interests in its relations with Hanoi will be of equal importance. Both sides’ perception of the above key factors will keep changing to reflect future developments in both countries as well as the Asian region as they unravel. Therefore, the comprehensive partnership should be viewed as the beginning of a new and exciting chapter in the US–Vietnam bilateral relationship rather than its culmination. Le Hong Hiep is a PhD candidate at the University of New South Wales, Australian Defence Force Academy, Canberra. He is also the founding editor of Nghiencuuquocte.net, a non-profit project that seeks to promote the study of international issues in Vietnam by translating English scholarly articles in the field into Vietnamese. Previous Previous post: Học giả quốc tế thay Việt Nam lên tiếng về biển Đông?